May the coming year be Art-Full and disaster free. This year’s blogs will focus on how to mitigate small and large disasters, what to do in the event of a disaster, and how to prevent even small losses from happening to your collection. It is important to keep data pertaining to everything in your collection, including original invoices, condition reports and conservation records, a clear photograph, bibliography, provenance exhibition history, and scholarly remarks. All of these things affect the value of your art. The best place to keep this information is in a database. An Excel spreadsheet is not sufficient, but if you do have information in an Excel document, it can easily be imported into a database. Whether you have 40 objects or 40,000, a relational database should be chosen for easy storage and quick retrieval of all relevant information. 1. What is your collection like? Do you have a large collection of a very wide variety of objects? If so, you may want to choose a database that is attached to Getty nomenclature. Do you have an archaeological collection, with many like items? Do you do very much provenance research? Do you exist to sell art? If so, you want to choose a database geared towards selling, with all of the pertinent fields to support many financial transactions. It is likely that the database you choose will not come all of the fields the way you would like them, but most if not all relational databases come with some or many customizable fields. 2. Do you work on a PC or a MAC, or both? Some databases are designed to run only on Windows, so in order to use them on a MAC you would have to run Parallels or Boot Camp. 3. Do you need to work “in the cloud?” This is the wave of the future, and though many people find it a necessary feature, maybe your collection is currently in one place, with one computer holding the data, and this is not important to you. Or maybe running network software will allow you to work on many workstations and/or remotely using a computer-sharing software. 4.Will you need to create a website in the future? Some databases have web interfaces that make this easy. TMS, EMBARK, (both by Gallery Systems) Art Systems, Past Perfect, Collectify, FileMaker Pro, and Access. Used by most of the big museums in NYC and probably across the country. It is very detailed, and robust, with too many fields and features to go into here. It is one of the more expensive software packages, and one must purchase and learn Crystal Reports- another related program- in order to run more reports than it is bundled with. This is a wonderful software, with every imaginable field, and linked contacts, ways to print labels, and so much more. It may be too dense for the smaller private collector or artist. Collections and Content Management Record and publish complete information on cataloguing, documentation, location, provenance and much more. Manage exhibitions, acquisitions, events, shipments, conservation and many other collection management activities. From any module within the system link and view digital media records, such as images, Web pages, documents, sound and video files. 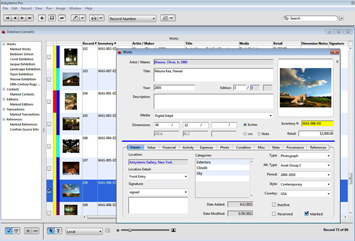 Physical media records such as colour transparencies can also be managed within TMS. Manage the inventory, licensing and circulation of such files. As well as a comprehensive range of standard ‘display modes’ for viewing and editing data, users can quickly and easily create their own forms for entering data, including all the fields which they are using and eliminating unused fields. Access to view, edit, add and delete data can be comprehensively controlled, down to an individual user and individual field level as required. Has all of the functionality that a collector would want, and much of what is listed above, but without all of the bells of TMS. And runs locally on a Mac. This is what I would choose for most collectors. It appears to manage images very nicely, and has a web kiosk. Has a number of good- looking products that are designed for different functionalities. You can choose from Pro (used by many galleries in NYC,) Studio Pro, Collections, websites, and web manager (costs extra), and Ipad solutions. From what I have read on the AAM Registrar’s listserve, people are generally very happy with this software and the support offered, and is relatively reasonably priced. They also offer data conversion for $80.00 per hour. I did not see many fields for different values, contacts, etc. But this would be a good basic program for someone on a budget who just needs a database. They have a “home inventory” software that is very basic but looks like it would do the job for inventorying your home- for only $49.95. I like filemaker as a database, but sadly there are no good art collection templates (“starter solutions” as they call them), and therefore it requires total customization. The price is very good, though at about $300 for one user. If you have time but a small budget, this is a good option. The downside is that it is a time investment, and you need to know how a basic relational database works, as well as what fields you need and how you would like them organized. I am currently making a database in filemaker because the client has a small budget, and does not own an art collection ; therefore they need something totally customized. From a non-developer standpoint, it is rather user-friendly to someone with a good understanding of databases. They also offer good-looking ipad and iphone apps. Be aware that you may have to run the more expensive server software on a dedicated computer in order to use them well. Access is a good basic database, with many of the benefits and drawbacks of filemaker. It is a Microsoft product, and is easy to purchase and install, and very economical. Like Filemaker, there are no art collection templates to use, so you will have to design and build it yourself. Again, there are developers out there who can be hired to design one for you, and that offers the benefits of customization. The true beginner may not know how databases are related on the “back end” or all of the fields that should be included. If you know exactly what you want and have good understanding of database structure, and have time to learn, this is another good option for PC users, and at about $109.00 it is affordable. This is a very inexpensive new program, based on Filemaker, called GYST. It only costs about $160.00, and include many other resources for artists, and ways to track all sorts of things other than information on the artwork, such as resumes and marketing, and legal issues. However, there are a number of fields necessary to good artwork recordkeeping that are missing, (such as “weight” for sculpture, and “current location”). It is not possible to customize fields, yet, though the developers seems open to suggestion. It looks like this would be good in the future, but is not quite ready for prime time yet. I hope this does not have you scratching your head, and wondering where to look first. Again, assess your needs, check out some of the websites above, and download trial versions of your favorite softwares to get a feel for what is right for you. Do you use a database? What do you like about it, and what do you wish were different?